I had visited the Bethlehem pictured in my mind over many decades. The sleepy village with shepherds on the hillside. Flocks of sheep bedded nearby for the night. Mary tenderly holding the Infant Jesus. Joseph hovering protectively, a wooden manger off to the side. That’s the Bethlehem created for us in pageants and paintings, stories and songs. Perhaps the images emerge from hope for what it represents. Peace. Love. Freedom from sin and pain. Eternity with God. The reality of Bethlehem is contested space. 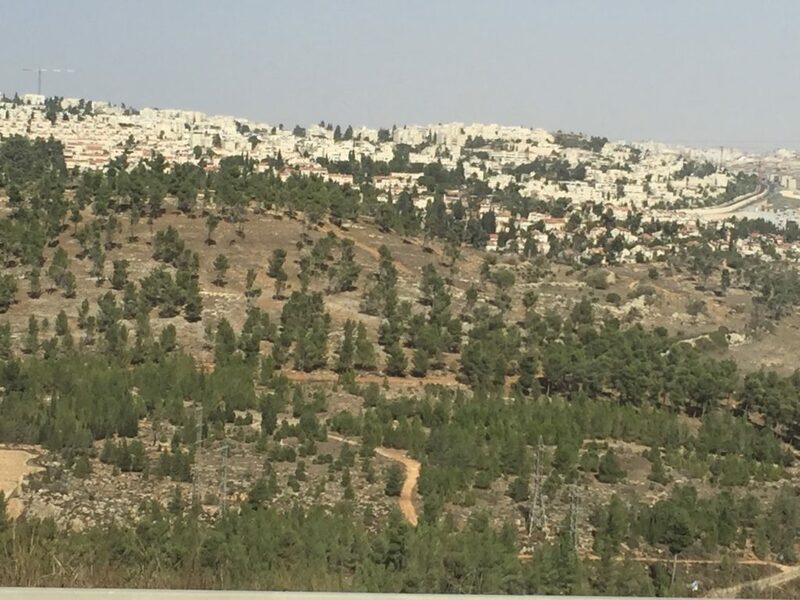 Bethlehem is no longer a village with a peaceful grotto cut out of limestone on the outskirts of town, shepherds and flocks nearby. No, it’s buildings of stone. Competing faiths and creeds. Churches on top of churches. 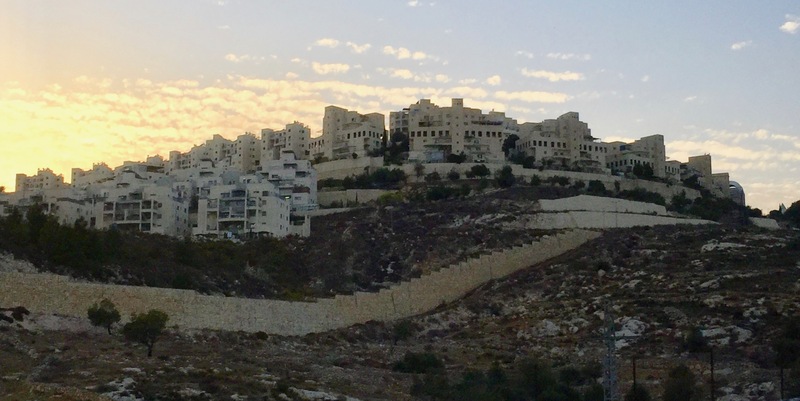 Modern Bethlehem has a population of over 220,000 (a 2016 figure) in a Muslim-controlled area of Israel. 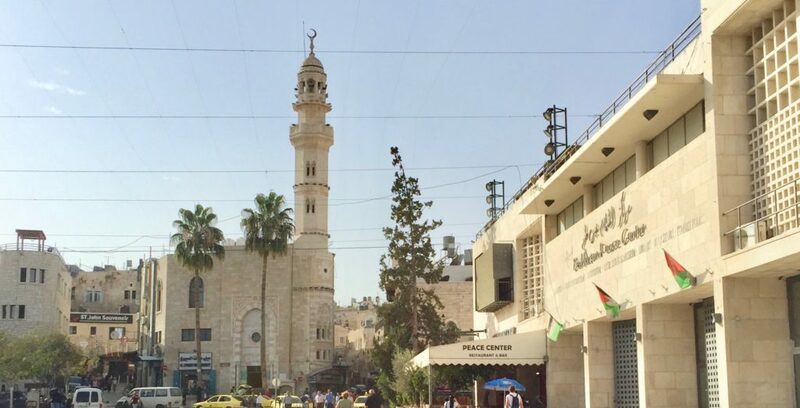 I found the official position by the city government concerning the Mosque of Omar located on Manger Square (the main square of Bethlehem) to be very interesting. ” The Mosque of Omar, located at the corner of Paul VI Street and Manger Square, was built in 1860 in honor of Caliph Omar Ibn Al-Khattab, who in the 7th century conquered the Byzantine Empire. 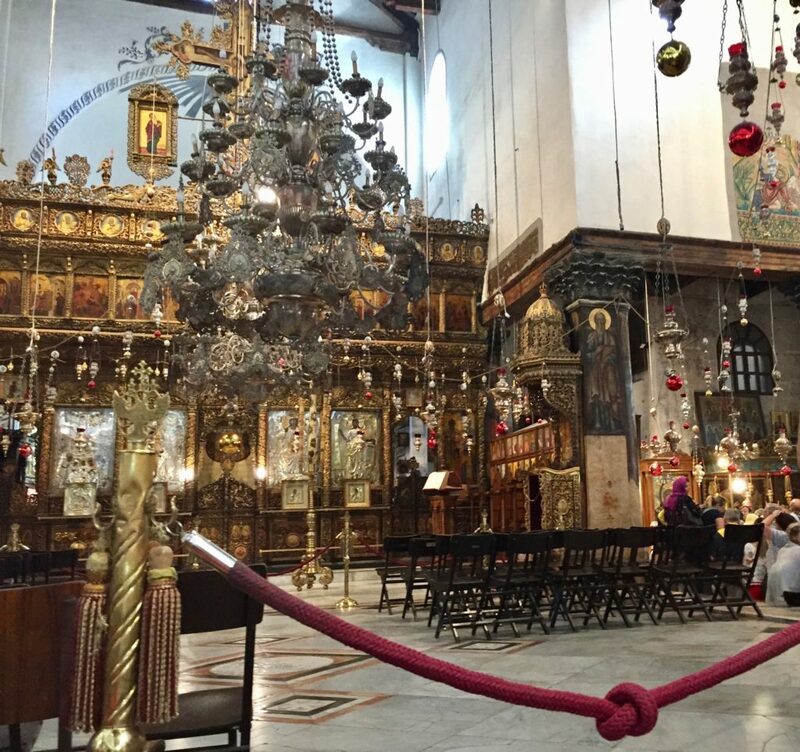 The Caliph prayed in the southern aisle of the Basilica of the Nativity, however, in the Pact of Omar, he decreed that the Basilica would remain a Christian place of worship. 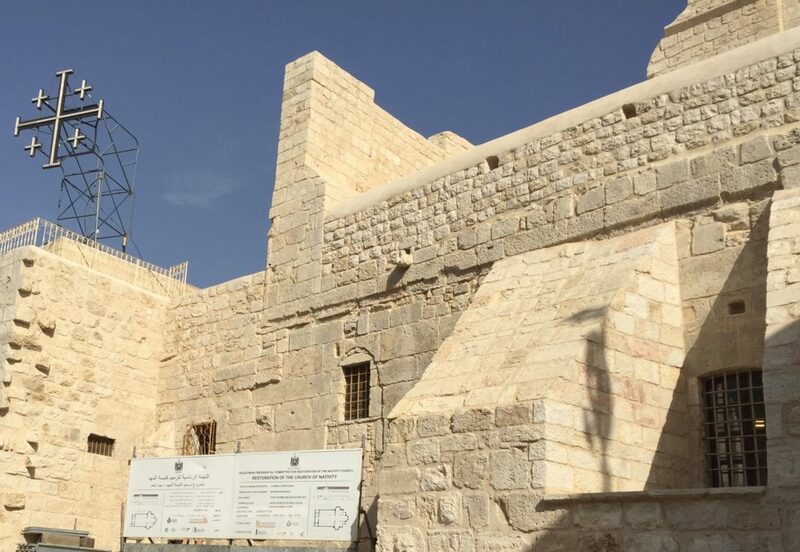 The document stipulated that Muslims would be allowed to pray there only individually and prohibited the call to prayer (al-Adhan) from being made from the church walls. Stars & Bucks — What! This is the street on the way to Bethlehem Square. The Stars & Bucks Cafe with the rip-off logo struck my funny-bone. Street vendors sell memorabilia for various religious groups; acceptance of diversity makes for good business. 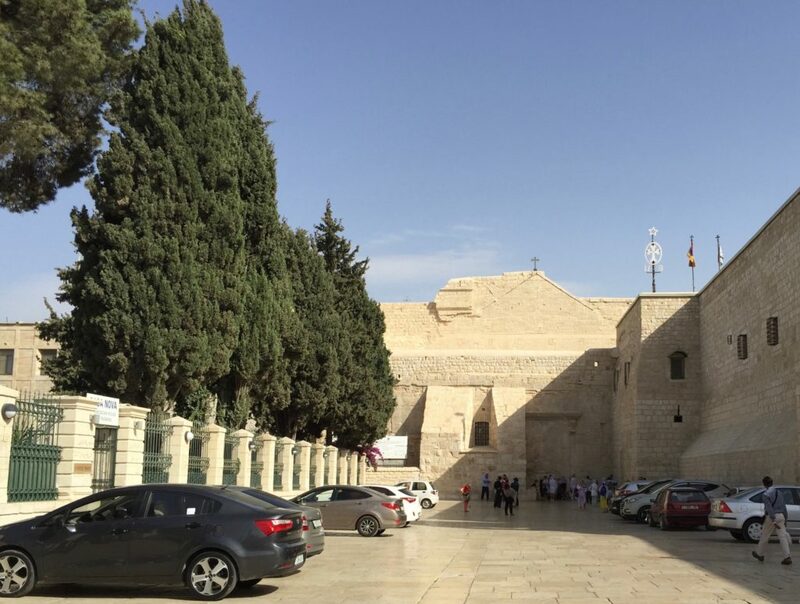 The parking lot for the Church of the Nativity seemed almost empty, but throngs of people inside the churches belied that impression! Wonder who actually gets a permit to park there. 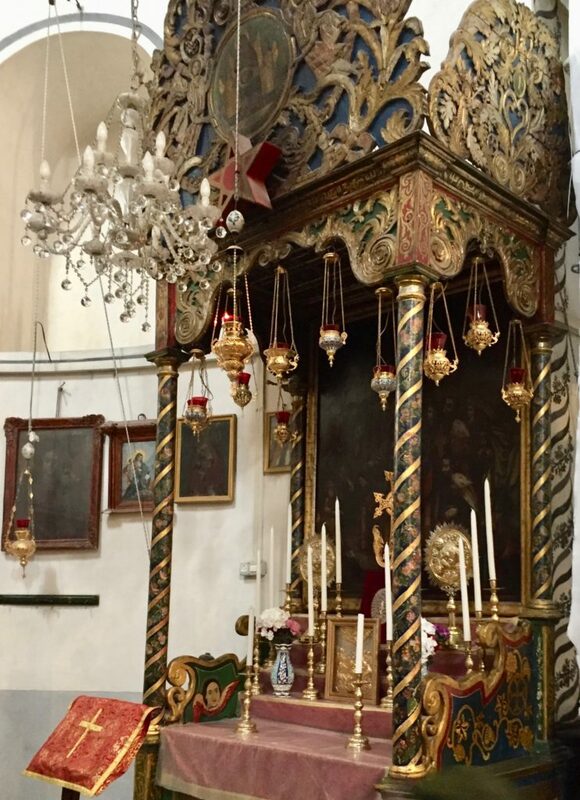 Since much of the restoration work has been completed on the Church of the Nativity, I wish the owners of those old videos hanging around on the Internet would take them down. They don’t do justice to the current interior. 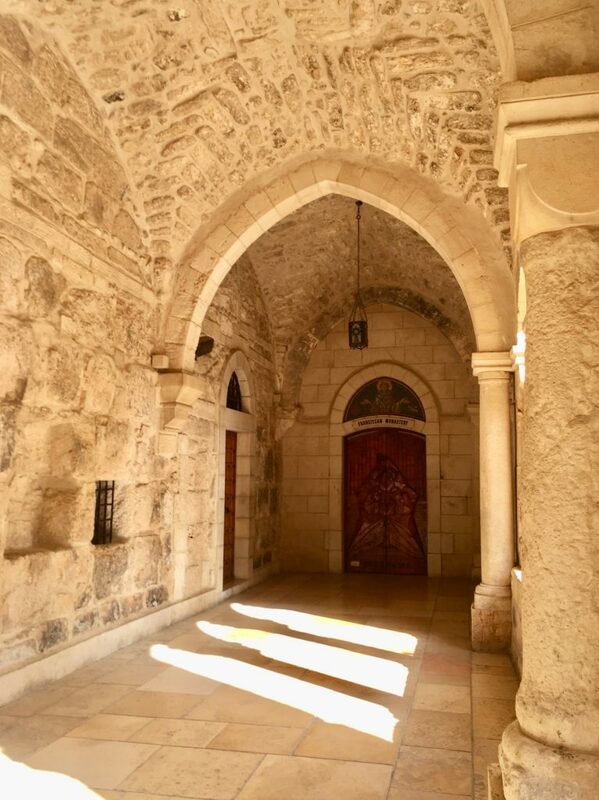 We were told that the Church of the Nativity is the oldest church in the Holy Land still in use because long ago the Persians destroyed all the churches except this one. 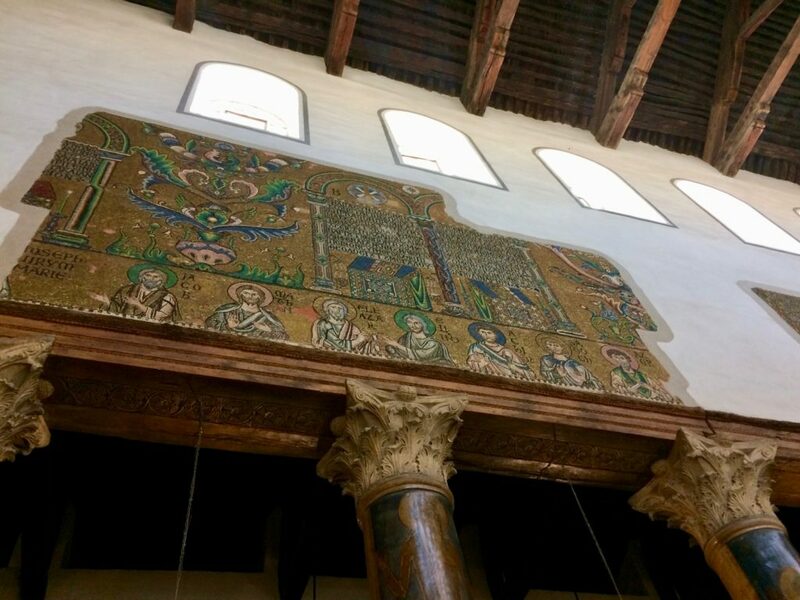 According to the locals, it was saved because some exterior mosaics portrayed men wearing Persian clothing–the Wise Men from the East. These mosaics no longer exist, so it’s hard to distinguish fact from legend. But then, there has to have been some good reason for the Persians not to have sacked this church as well as the others. 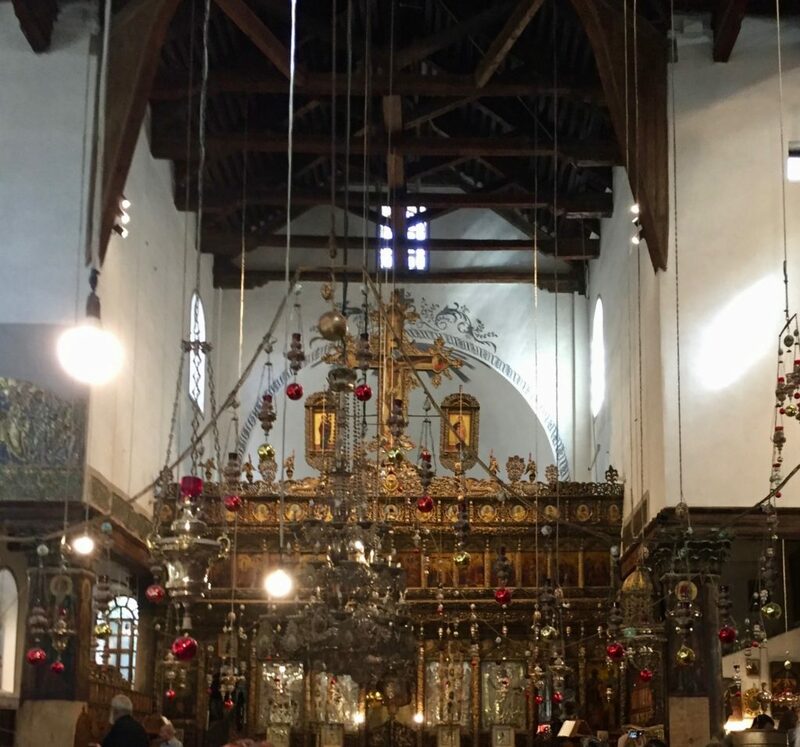 Note the Jerusalem Cross above the Church of the Nativity. It’s called a “Five-fold Cross” (just count the total number of crosses to figure this out), which is a heraldic device from the Crusader period of the Kingdom of Jerusalem in 1280 AD. 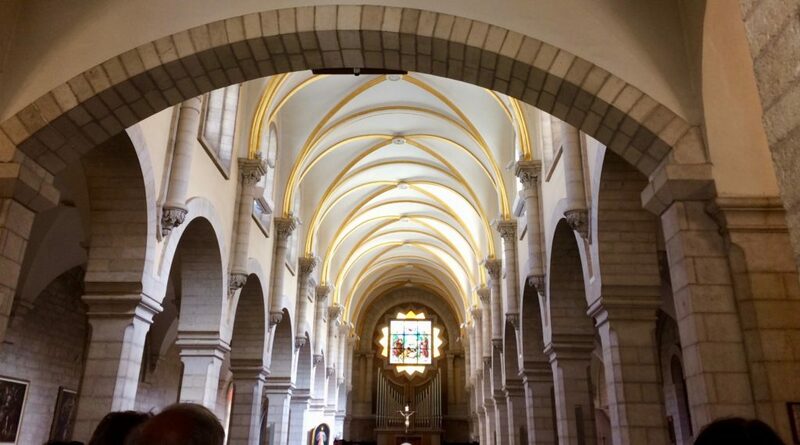 The Church of the Nativity dates from the 4th century and some call it a Crusader church. Listed as a World Heritage site, the fine restoration work retains the architectural style of the Byzantine Empire. The Church of the Nativity is built over the grotto where Jesus is said to have been born. But the three-hour wait to enter that area below the Church of the Nativity diminished our eagerness and we finally decided against the visit. The three churches inside the grotto area are Greek Orthodox, Armenian, and Catholic. As I gazed around this ancient edifice, I admired unreservedly the lavish ornamentation of a bygone era when the Byzantines held sway. 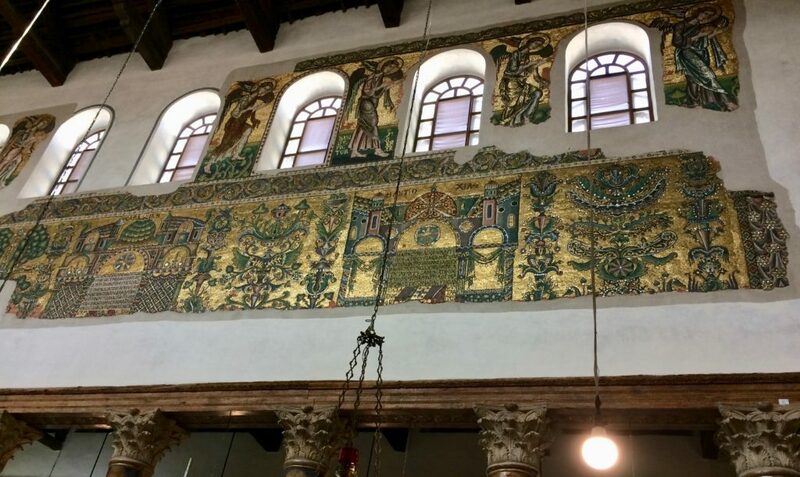 The restored mosaics above and below exhibit strikingly vivid colors, and elegance of design. For details on their history and restoration, I’ll refer you to a good article written a few days ago (16 Dec 2018) for the Telegraph in the UK. As events unfolded, the sounds of the organ next door lured me toward it. In the Catholic church nearby, I thought I was making a fabulous recording of the organ to upload for you. Actually, the recording contained people noise! I cropped all the heads and shoulders out of this photo as my private little revenge. I want to remember the music, and eliminating the people helps me! The organ in Church of St. Catherine of Alexandria is very lovely and I would love to hear it played in a formal setting. Meanwhile, I had lost my friends. Previously they had expressed a desire to find a place for some quiet contemplation, so I was sure they hadn’t left me. But I had to puzzle out where they could have gone in that complex maze of rooms. Crossing through this lovely courtyard with it’s bitter orange trees, I found them seated quietly on the floor in front of the Franciscan Monastery doors. My friends and I sing four part harmony in regular worship services. With the cool plain sandstone surrounding us, we sang from the depths of our souls the old favorite Christmas carols from our childhood. The longings of our hearts held in those comforting lyrics, those familiar strains of song. I’ll long remember the feeling as we sang the joy of Christ’s birth in Bethlehem. 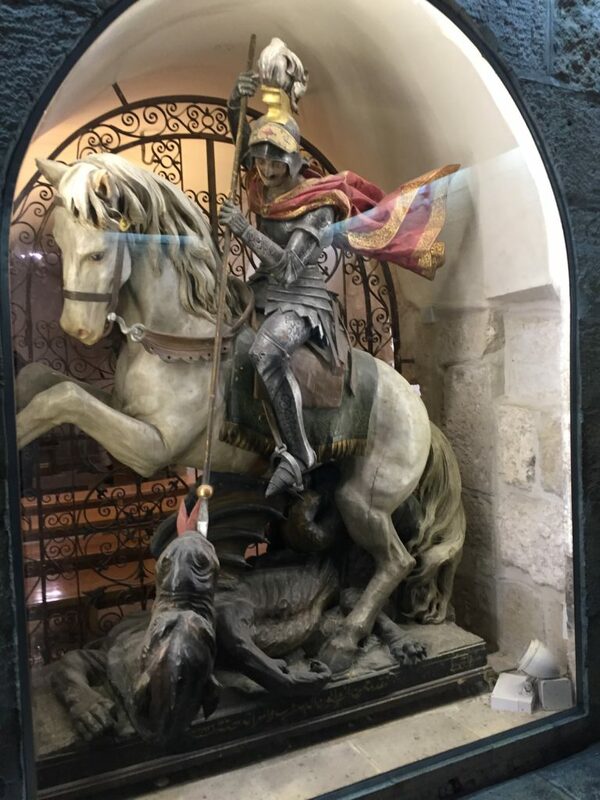 It seems that everyone who exits the Church of the Nativity has to pass by this large statue of St. George slaying the dragon, but I wasn’t open for any more evidence of the Crusader spirit right then. I felt softened in my heart due to the carols and I really didn’t want to meet St. George on my way out. 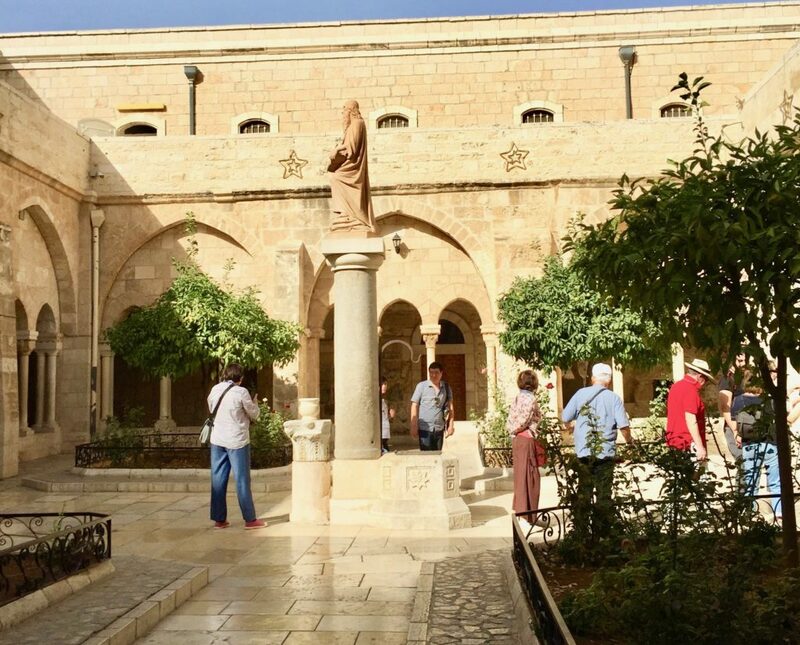 Yes, I’m glad that I visited Bethlehem. Certainly the place wasn’t how I wanted it to be, but what it meant to me was everything that I needed it to be.